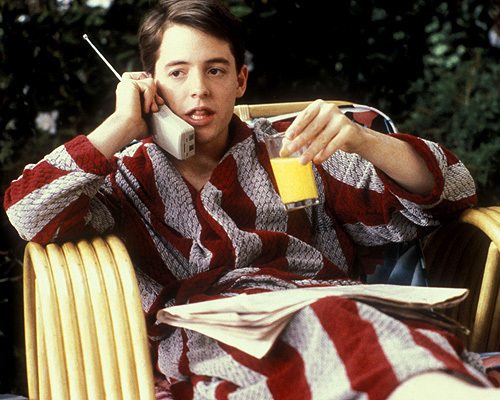 Why Do You Love Ferris Bueller’s Day Off? Bueller!! But what exactly is it about the movie that makes it an all-time favorite? 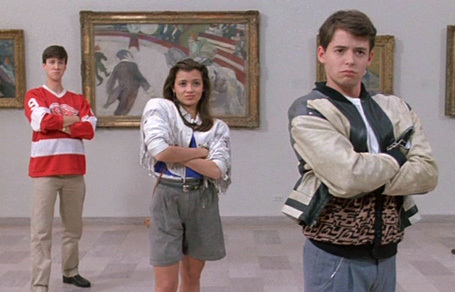 Because Ferris ROCKS. Who doesn’t want to be Ferris? I was living in the Chicago suburbs, just like Ferris, and was able to visit the scenes in the movie for research. The Wrigley Tour was a lot of fun! The movie is timeless and can appeal just as easily to oldsters like me and the teens of today (and tomorrow). As Ferris was filmed at a suburban Chicago high school, that gave me the link I needed to get Nat involved and an easy way to bring the action (in some cases) to her. I loved John Hughes in general and thought he had a real knack for capturing teens. I love that now there are people calling the book “John Hughes-esque” !! Ferris is an endearing person because unlike most teenagers he isn’t motivated by hormones, insecurity, or peer pressure. The frustrating thing about being a teenager is you are in an adult body, but you don’t have the experience or know-how to navigate life successfully. Ferris is already the person all of us hope to be when we grow up, years ahead of his years, but a benevolent soul if there ever was one. And while some would argue that he abuses his powers of persuasion because he is the smartest one in the room (and knows it), for the most part he wields his power for good, and for a perfect day off. I think why I loved (and still love) Ferris Bueller’s Day Off so much is because Ferris Bueller was just the best kind of cool- not the snobby Mean Girls kind of cool that you love to hate, or the distant Outsiders kind of cool that you know you’ll never be – he was cool just because he was so totally himself, which is a real achievement in high school (and beyond!). It was fun watching him because he was *just* normal enough that you could see him and feel like his extraordinary life was not beyond your means, that you could one day pull your own ‘Ferris Bueller’. The scene where Cameron Frye ditches the introvert-sidekick role, gets angry and trashes the Ferrari. That lightbulb moment when he realizes he has to learn to stand up for himself, especially when it comes to his father. It’s nice to see his character growth after becoming attached to him, feeling all of his panic attacks and insecurities throughout the film. Rufus Brutus the Third: I admit to watching the movie, just to see what the fuss was about. In my opinion, Ferris is quite cat-like. You can take that as a compliment. He’s quite devious and sneaky and he knows how to get what he wants. I like that about him. Purr Daddy: You watched the movie? Rufus: Well, I felt I should. People keep talking about this Ferris fellow in reviews instead of about ME. I still don’t understand why. I am clearly more adorable and loveable. I have FUR. Purr Daddy: It’s not always about the fur, Rufus. All these fond memories make me want to watch and relive the adventure again! 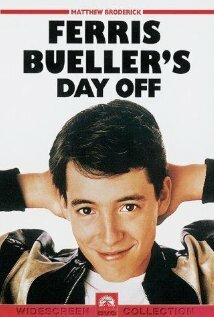 So, what do you love (or maybe not love) about Ferris Bueller’s Day Off? Previous PostAnother Sensational Summer Read Aloud!Next PostRead the first three chapters of Summer of the Mariposas!